Wastren Mediterranean Sea in 264 BC. Roum is shawn in reid, Carthage in purpie, an Syracuse in green. 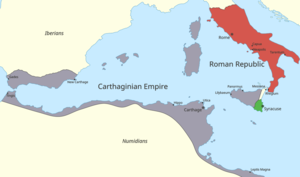 The First Punic War (264 to 241 BC) wis the first o three wars focht atween Auncient Carthage an the Roman Republic. For mair nor 20 years, the twa pouers struggled for supremacy, primarily on the Mediterranean island o Sicily an its surroondin watters, an an aa in North Africae. The war signaled the beginnin o a strategic transformation in the wastren Mediterranean. Carthage began the war as the great sea-pouer o the wastren Mediterranean, while Roum haed but a small fleet o fechtin ships. Ower the coorse o the war, Roum biggit up a pouerfu navy, developed new naval tactics, an strategically uised thair navy, airmy, an local poleetical alliances on Sicily in order tae achieve a victory that expelled the Carthaginians frae Sicily. The First Punic War endit wi a treaty atween Roum an Carthage, but years o bluidshed war tae follae in the Seicont an Third Punic Wars afore the strategic issue o pouer in the wastren Mediterranean wis resolved in favour o Roum, an in the tot destruction o Carthage. ↑ Encyclopædia Britannica. 1911. "Rome." vol 23 p634. ↑ 2.0 2.1 2.2 Encyclopædia Britannica. 1911. "Punic Wars." vol 22 p649. This page wis last eeditit on 20 Mairch 2017, at 04:45.